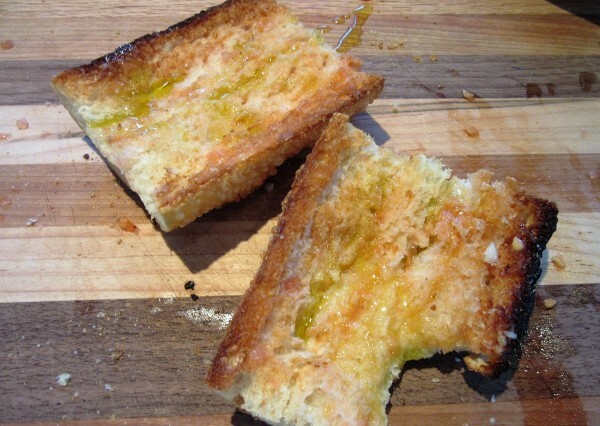 Bye Bye cheesy, greasy garlic bread. There’s a new kid in town and I am in love! 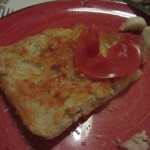 There is never anything wrong with the combination of Tomato, Garlic and a good crusty Bread. Sparky and I returned home from Barcelona, Spain late last evening and I was at the grocery store at 8am buying the ingredients to recreate this amazingly simple and superb Tapas! Ordering Tapas is just such fun. 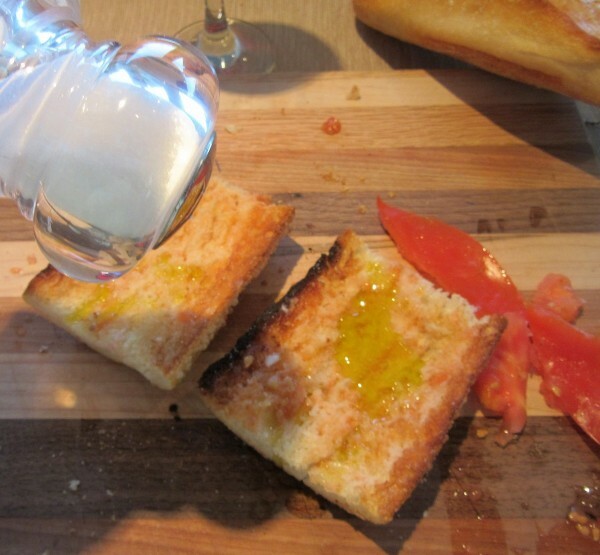 In Spain, they have long menues of small plates that you can order and it’s fun wandering Restaurant to Bistro to Cafe’ picking out different small bites. And ohhhhh….were they ever delicious! This is a quick, easy recipe using only 5 ingredients and it takes 5 minutes to prepare. Munch on it with your other small plates. Snack on it while preparing a meal or serve it along side Fish, Chicken or Paella! Guaranteed you’ll be so impressed with the results that you’ll make it over and over again. We loved it so much we ate it every day in Spain! I made some up today to photograph for this blog with the intention of giving them to Dan, but when they were ready, he was on the phone, so I ate them myself, ’cause I’m like that, ya know? 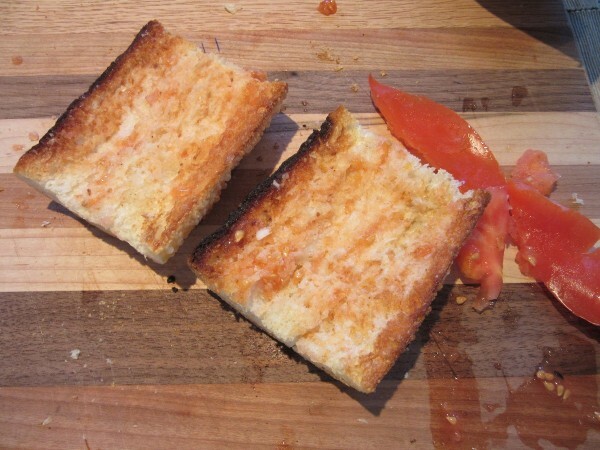 Let’s build us some Tomato Garlic Tapas Bread! This is what we’ll need. 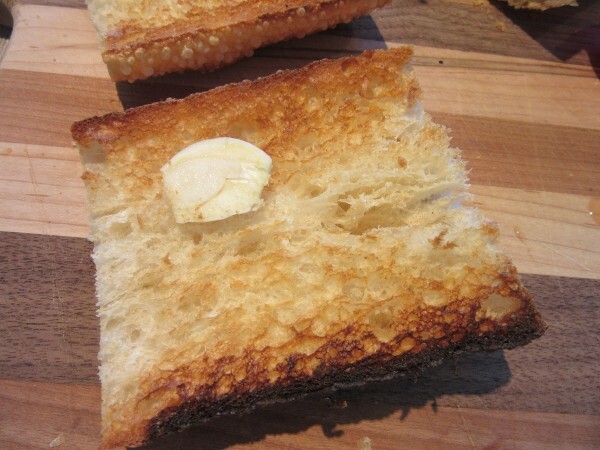 A good crusty bread that's been sliced and toasted is essential. 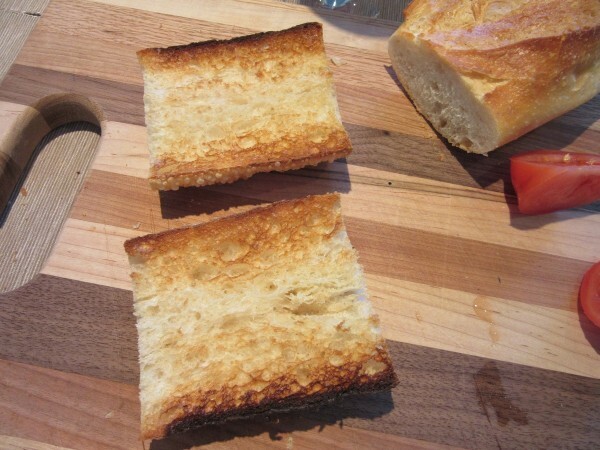 You can use a Baguette or Ciabatta or something similar. Rubbed with Garlic and tomato then finished with Olive Oil and Salt and your guests will beg you for the recipe! Take the sliced bread and toast it until golden and crisp. Rub all 4 cut sides of the toasted bread vigorously with the raw Garlic. Be generous if you are good friends with whomever is eating it! 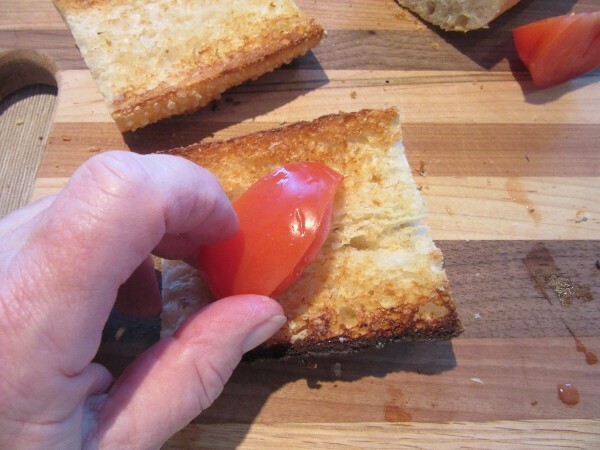 Then take the tomato quarters and rub them vigorously over the same cut sides of the toasted bread leaving a nice smear of tomato. I like them nice and tomato-ey! 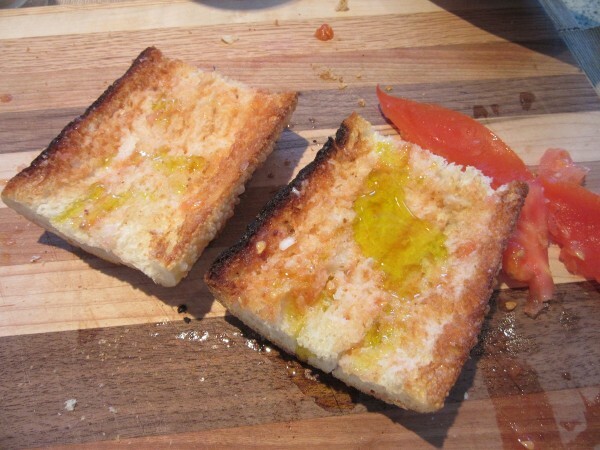 Drizzle each bread slice with Extra Virgin Olive Oil. Sprinkle each slice of bread with salt. Call your husband and when he doesn't appear, eat them all yourself! OH MY GOODNESS! Why oh why have I never heard of these before? Life is short and I now have some catching up to do! omg, i’m making this tonight. It looks yummy. For variation you could add a sprinkle of some sort of parmesan type cheese. Asiago would be nice. Thank you Karen! I hope you enjoy it! 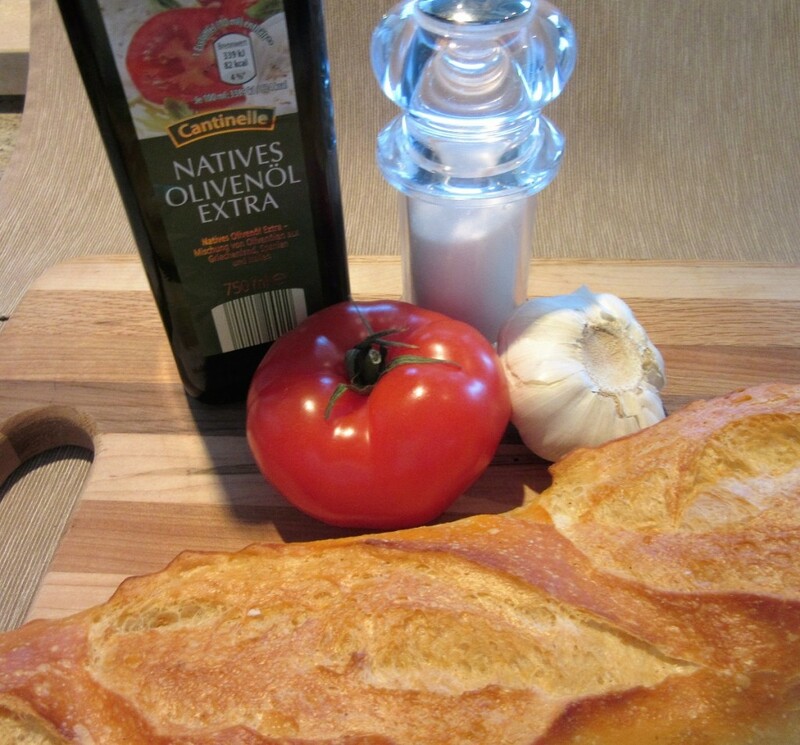 Heart healthy Garlic and EVOO. And flavor to boot! Oh yummy, I’ll be making this. Hope you really like it! Thanks for commenting. I love how the media still loves to put some moron who bought in 2006 in the first paragraph of the story as if we are supposed to feel sorry for them because they didn’t buy a house out of their price range and now they can’t sell it for what they bought it for. Jesus, take the hit al#aidy&r8230;.ets not like people don’t cough up 15k for rent every year. I hope you have a chance to try it! Thanks for commenting.